The Kenya School of Preaching (KSOP) is thriving under the capable leadership of Charles Ogutu, Director, and Elias Omallo, Academic Dean. Dr. Denny Petrillo and I (Dr. Michael Reese) recently were on the campus of KSOP, located at Hellena Court in the Migosa area of Kisumu, Kenya to teach several short courses. Denny taught a short course, Daniel and Ezekiel February 29-March 4 to the twenty undergraduate students. I taught a graduate class to six Master’s students March 1-4 on the book of Hebrews. March 7-11, I taught Education Program of the church to the twenty undergraduate and two Master’s students. I have seen tremendous growth both academically and spiritually in these KSOP students. Several students who in previous classes had, in my opinion, not performed to their potential, have recently “set their hand to the plow” and were working very hard. All the students have grown in their computer, research and writing skills. Their Bible knowledge has grown exponentially evidenced by their sermons during chapel, keen Scriptural insights presented during class discussion and their well-used and worn study Bibles. Rest assured, the Kenya School of Preaching is making impact in the Kingdom in East Africa. Each weekend when school is in session, KSOP students travel to work with area congregations. Many of the students are involved in evangelism on Saturday and teaching, preaching and leading singing on Sunday. When these students travel and work with area congregations it strengthens both the students and the congregations. Just one example of the work of KSOP students is evidenced in Maurice Onyango and his effort with the Ikumu Church of Christ. In August of 2015, Maurice planted the church in Makhokho area during his quarter break. While conducting evangelism he learned of the Ikumu Church of Christ that had been planted in 1981 but had drifted away from faithful worship and regular attendance. Through the efforts of Maurice’s planting and watering and God giving the increase the Ikumu congregation is meeting on a regular basis and practicing New Testament Christianity. Denny Petrillo and I visited Ikumu on Sunday, March 6. There were sixty-eight in attendance. This work was begun and revitalized with $50.00 U.S. dollars, fifteen Bibles, and a lot of hard work and God’s blessings. There are stories similar to this all over East Africa of KSOP and graduates of other Bear Valley preacher training schools doing mighty work in the Kingdom with little or no outside financial support. The facilities at KSOP are adequate for now but more room is desperately needed in the future. In December 2015, 2,400 pounds of books were shipped via container (thank you Mission Printing) to Arusha, Tanzani. Charles Ogutu and David Wasonga travelled to Andrew Connally School of Preaching in Arusha, on March 14-15 and transported the 71 boxes of books to KSOP. What a tremendous blessing these books will be to students and churches in Kenya. May God continue to bless the Kenya School of Preaching and all the Bear Valley schools as they continue to teach faithful men “. . . who will be able to teach others also” (2 Tim.2:2). Posted on March 27, 2016 by Robert Turner and tagged Extensions Kenya. What a distinct privilege it was to spend time with Denny Petrillo, president of BVBID recently at the Kenya School of Preaching in Kisumu, Kenya. Denny taught a short course, Ezekiel and Daniel, for the undergraduates and I taught Old Testament Theology to the Master’s students February 24-28, 2014. Bad weather delayed my trip one day so Denny had to travel alone (sorry Denny). However, I got back on schedule Monday morning (Feb. 24) and only missed teaching one hour of my class. 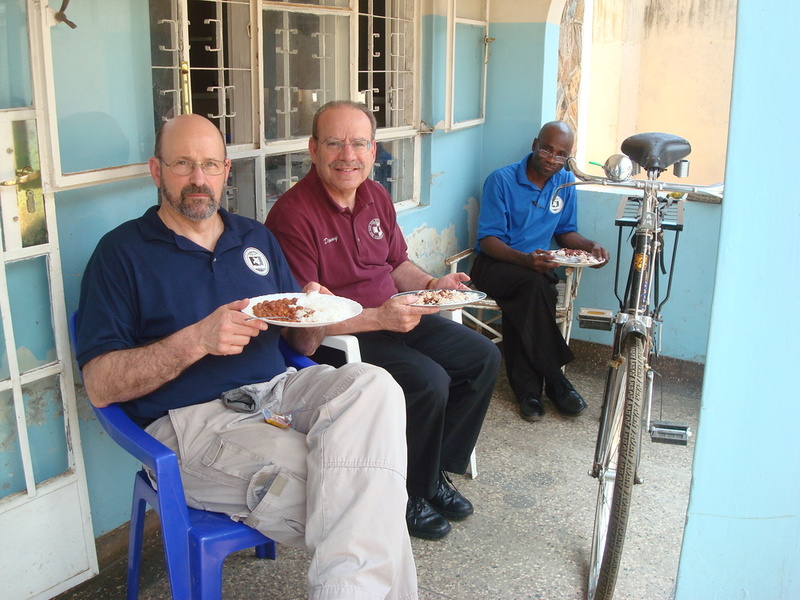 Thursday (Feb. 27) the Charlotte Avenue group joined us in Kisumu before their return flight home on Friday. Charlotte Avenue, (of Rock Hill, S.C.) is the overseeing congregation of KSOP. Their group, consisting of Mike and Teresa Rowand, Dow Hix, David and Debra Thompson and Aaron Gallagher, had conducted an evangelistic campaign with KSOP students and local evangelists in Ndwara (a church planted late last year outside of Bondo, Kenya). Denny and I were able to worship with the good brethren in Ndwara on Sunday, March 2, where 32 were present. God blessed the efforts in Ndwara and Butere with 32 baptisms. Praise God! KSOP is so blessed to have Charlotte Avenue as the overseeing congregation. One of the greatest blessings is that Charlotte Avenue is “hands on” in their mission work. Mike Rowand and Dow Hix are elders at Charlotte Avenue and David Thompson is a deacon. Thank you to the men and women from Charlotte Avenue for your tremendous zeal and dedication in the kingdom. On Friday, Feb. 28, a rare event took place in that the president of BVBID, Denny Petrillo, Director of KSOP, Charles Ogutu, an elder of the over seeing congregation of KSOP, Mike Rowand and the Coordinator of KSOP, Michael Reese, were all able to meet in Kisumu, Kenya for dinner. I know other BVBID extension schools have tremendous support. I am sure, however, that to have this combination of men involved with a Bear Valley School together at the same time in the same city of the extension school is rare. On Saturday, March 1, Denny Petrillo, Mike Rowand and I (Michael Reese) accompanied by David Wasonga (evangelist at Ahono Church of Christ) and Joseph Patrick Tuju and Caleb Omolo (elders at Ahono) were able to visit the Nyamasare congregation (in Ugunja, Kenya) and help with the planning of a church building for this new congregation. It was great to see the long-term impact of graduates of Bear Valley Schools in East Africa. David Wasonga is a graduate of Andrew Connally School of Preaching in Arusha Tanzania (with both a Bachelor’s and Master’s degree). He also is an adjunct teacher at KSOP. Yet David is a true evangelist working diligently to help congregations like Nyamasare grow. On Sunday March 2, Mike Rowand departed for Nairobi and eventually back to his home in South Carolina. On Monday, March 3, Denny Petrillo departed for Denver, CO. All alone, I began my second short course, “The Education Program of the Church,” with 18 undergraduate and graduate students. Many congregations in East Africa do not have children’s classes or teachers trained to teach. 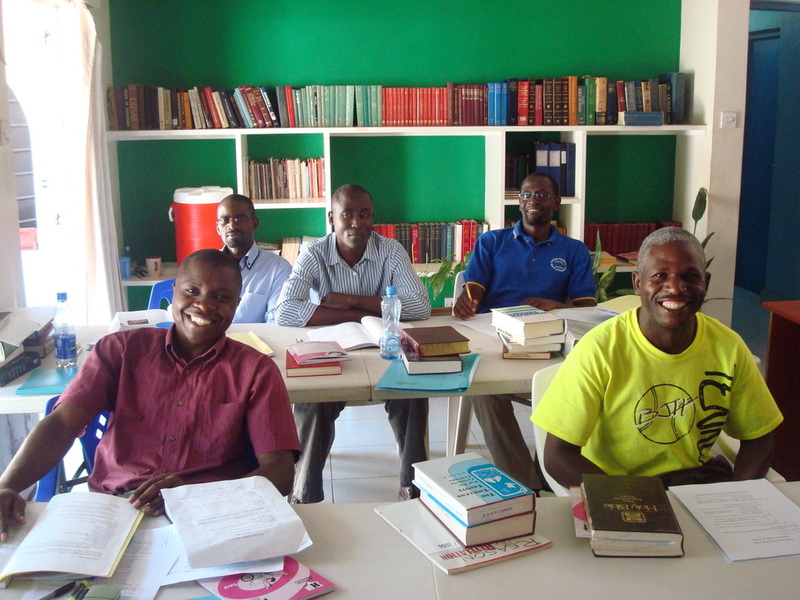 In this class the students learned how to establish and administer a Bible School program in the local congregations of East Africa. 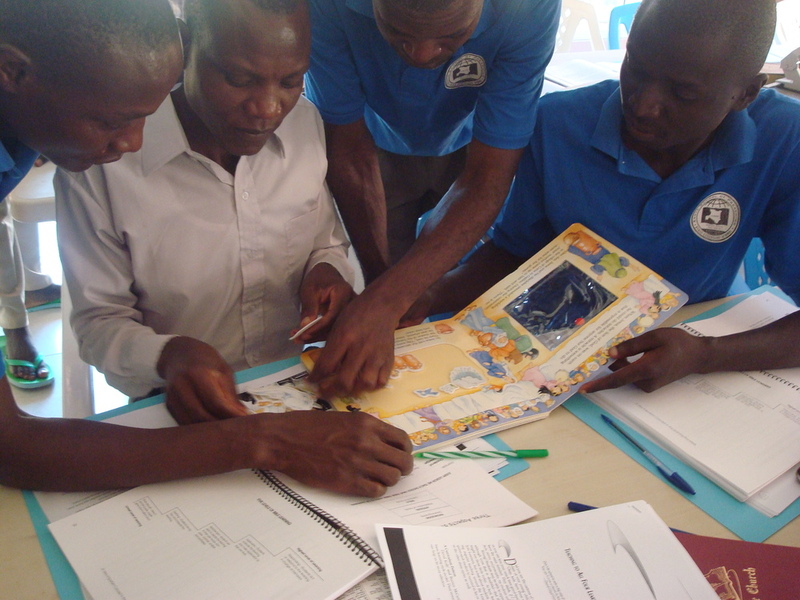 The class included teacher training as well as learning how to develop and teach age-appropriate lessons. I personally enjoyed teaching this class as much as any I have ever taught. Thank you men for a great class. On Friday afternoon, March 7, I began the long trip home, arriving back in West Virginia around 9:00 p.m. Saturday evening, March 8. I have learned that each trip is unique in its challenges, blessings and rewards. This trip was no exception. I would like to thank God for allowing me to be a part of this great work, the men and women of Charlotte Ave., Charles Ogutu our director at KSOP, (and Elias Omallo, academic dean) the elders of the Bear Valley Church of Christ for their worldwide vision to spread the Gospel and the very capable president of BVBID, Dr. Denny Petrillo. May God continue to bless this work richly.